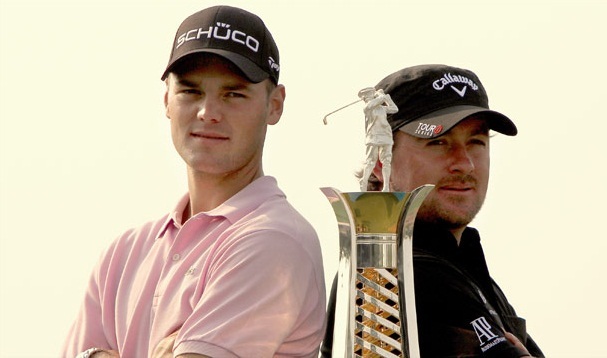 Graeme McDowell and Martin Kaymer both Ryder Cup teammates have jointly been awarded the 2010 European Tour Golfer of the year award. This is has been the first time that this award has been shared in 26 years.Judges were unable to have consensus on one after a lengthy discussion so at the end European tour chief George O'Grady agreed to the panel's suggestion of an unprecedented tie. Both the players had an exceptional seasons,both winning four tournments each. The 31-year-old Irish McDowell won his first major -- the U.S. Open . He also posted the winning putt in the Ryder Cup that confirmed Europe's victory over Americans at Celtic Manor at Wales.His win over Woods in the last week's Chevron World Challenge was amongst the biggest upsets where Woods had an obvious four shot lead the previous day, and was almost certain to win. Kaymer on the other hand won the U.S. PGA title,with also putting the Irish McDowell to task in Dubai winning the Race to Dubai money list. "I am truly humbled to accept this coveted award. It is the icing on the cake on what has been a very special year for myself, Martin and everyone involved in European golf". "It is recognition for my performances in 2010 and to be voted for by the golfing media, the people who watch and report on our sport throughout the year, makes me feel very proud." "Graeme and I had pretty much the same level of success this season and he deserves this recognition as much as I do," added Kaymer. European golf took a great leap in 2010 where, Lee Westwood overunned Woods taking the world number one spot, while Francesco Molinari and Ian Poulter won World Golf Championship events.Also Jospeh Bramlett just 22 years, became the second African American to secure the US PGA Tour card,following Woods .